Summary (from the inside flap of the book): One morning, fourteen year old Angel wakes up at her isolated trailer home deep in the California desert to find that her mother has been murdered. 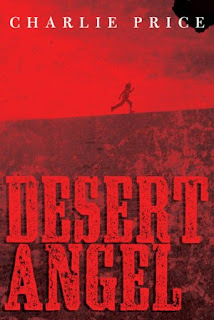 Angel knows the killer: her mother's boyfriend, a tweaker lowlife named Scotty, who has vanished. she also knows that Scotty, an expert tracker, will surface soon to eliminate her as a witness. Angel has no water, no weapon, but she is good at making herself scarce. Her flight takes her into an unforgivingly harsh landscape with Scotty only a few deadly steps behind. On her own, she may not make it. Then she stumbles across a shadow community of people willing to help her. These tough, secretive outsiders are exactly the kind of people Angel needed to find--forcing her to trust others for the first time, strengthening her in ways she will have to discover... because Scotty is closing in. Review: I was in the mood for a quick YA read that really captured my attention and I certainly got it with this book! I read all but 20 pages yesterday afternoon, finishing it early this morning before getting up for work. Although Angel is only 14 she has had to live by her wits for a long time, ever since her mother started taking up with really bad men who abuse both Angel and her mother. So, when Scotty kills Angel's mother, it is not surprising or unbelievable when Angel runs away from Scotty. And Scotty is a creep of the first degree, unfortunately also a true-to-life character. As I read I wanted to believe that something like this couldn't happen, that the author had gone too far, but I think he got it right. There are major creepy people out there and Price has captured them in Scotty. Luckily he also shows the wonderful side of humanity as well in Abuela, Ramon, Rita, and their community who gather around Angel and help her when she needs it the most, even if she thinks she can go it alone. The plot is gripping, fast moving (but not too fast), and makes the reader want to get to the end to see if it all turns out okay. While endings sometimes seem to fantastical and fast in mysteries, I didn't find that to be true with this one as it comes to a climax and satisfactory ending.